(09-13-2018, 03:29 PM)jteneyck Wrote: Perhaps you misunderstood what I said. If you put the board on the slider to rip it's just like cutting a panel, where your hands are no where near the blade. You still need to control the rip side of the cut. I have used sliders of all sizes and types for many years. You cannot rip a 4’ board with the slider, that requires a rip fence. Watch Woodcademy TV free on Amazon Prime! If the slider is longer than the board you can use it to rip. It's no different than cutting a piece of sheet goods. (09-13-2018, 10:05 PM)handi Wrote: You still need to control the rip side of the cut. I have used sliders of all sizes and types for many years. Ripping with a slider is safer and quicker than ripping with a table saw and rip fence. You can rip as long as you like, (1) with a slider longer than the board, (2) with a platform on the slider (but that is for another day). 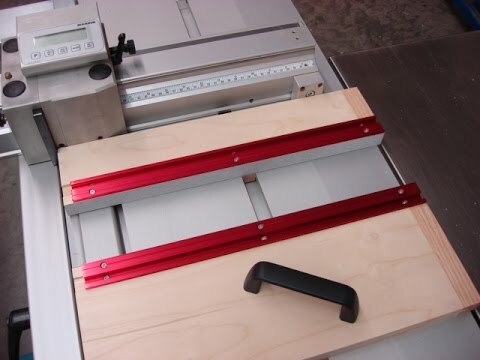 The F&F jig is a huge step up from the rip fence, and it is the major difference between a slider proper and a table saw with a crosscut sliding accessory. They are completely different machines. I own and regularly use a Minimax CU300 classic with a 5' slider. It's perfect for my shop. I have only done one project in which I have needed a full sheetgood for the end result (meaning, I had to cut 2 panels off the entire 8' length) otherwise, the 5' handles everything I throw at it. I think my table capacity is ~ 225lbs or so, this is key back to that adjustability / stability. I've seen altendorfs and I swear those monsters could have a volkswagen on the carriage and you'd still be able to 2 fingers push it. If you buy used, be prepared to invest time. If you buy economy, expect to have to tune. It'd be best if you can speak with other owners before jumping in to ensure it doesn't become the project you work on most often in shop. If you buy premium, expect a mortage... lol. There's a price to all of them. Plenty of users and knowledgeable fudge on here about them though, ask the questions and get answers that satisfy you before diving in. Pics of two Griz sliders I took for a member last year when I went to Grizzly in Missouri. Glad its my shop I am responsible for - I only have to make me happy. (09-12-2018, 08:19 PM)garmar60 Wrote: So my wife went to the book store without me. For an unknown reason she was looking at a woodworking magazine and saw an add for a euro sliding saw and a smaller table saw with a sliding table set away from the blade (the first saw had the table against the blade). She didn’t really know what she was seeing but it got her concerned with my safety. 28 years no accident, griz 1023 10 years no guard ( I really don’t like it. Can’t see with it on. Have to push too far to clear back side). I use a lot of plywood too. I had a cherry vintage unisaw and traded it for a Festool track saw and a multifunction table. Haven't looked back. Don't miss the unisaw at all. Also consider a panel saw. If you don't have the room for the PS and like being able to be portable [a big plus for me] then consider a track saw. They're life changing. But you've got better choices for plywood that are MUCH safer and MUCH easier.